From separate Best Buy stores, in different parts of the country, David and Adama sent us these two pictures of deeply confusing, Target-worthy sales. 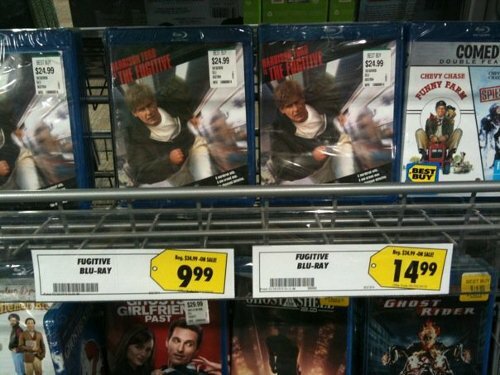 Would you like to buy a Blu-Ray of “The Fugitive” for only $14.99? Or you could go a few inches away, where it’s $14.99. If you need something to play it on, you can get a Blu-Ray plater for 50% off its original price if you buy a TV. That original price is either $129.99 or $149.99 depending on where you look. I like to imagine that when you bring these items to the register, a third, even more mysterious price shows when they are scanned.